Still digesting six weeks working in Antarctica as the Photographer is Residence for G Adventures. Having complete my 8th crossing to the white continent, it never ceases to amaze me how breathtaking this region of the world continues to be after multiple visits. Will follow-up with more galleries as I begin getting through almost 12 thousands photographers. Happy to have finished a small line of postcards; printed and ready for sale on board the M/S Expedition while I am in Antarctica working as their Expedition Photographer. The great thing, even in this day and age of email and social media, I am sure everyone wants to receive a postcard from Antarctica! The Stamp alone is classic. A portion of all sales will go to Planeterra to help support projects in the polar regions that better the environment. Antarctica is once again on the horizon, a mid December departure this time, as always the preparation is part of the fun. New lectures to give, new photo opportunities to look forward to, and the somewhat bizarre realization I need a tuxedo shirt, since my journey will mean a christmas and new year celebration on the white continent, why not look good for it. I mean, why not…how many times does this opportunity happen? Except for me this is my fourth journey down and I will spend six weeks this time, my longest stint, doing three crossings with my first landings in the Falklands and South Georgia Island. I have uploaded a new gallery of Easter Island photographs, shot back in 2006. This is a destination that seems to have been photographed so much that the challenge of making my work unique, I choose to shooting with Infrared film. This gave the subject matter a magical quality to a location already surrounded in mystery. Nothing more fun than photographing puppies! These dogs are 4 weeks old and will be fostered to families for a year to socialize and then will be trained for the disabled. Blind, deaf and autistic individuals benefit from the Lion's Club of Canada and the Dog Guides Program. Their mother is doing just fine. I will slowly be rolling out several new galleries covering infrared work, studies of the human form and more travel destinations. some galleries from my old site have been removed (africa, the americas etc) but rest assured they will be back online shortly. happy to bring a new look, new work as I go forward into a very busy year ahead. Expedition photography be will taking me to some 14 countries through africa and a return to where everything started for me, Antarctica in December. More galleries to be rolled out over the next few weeks. 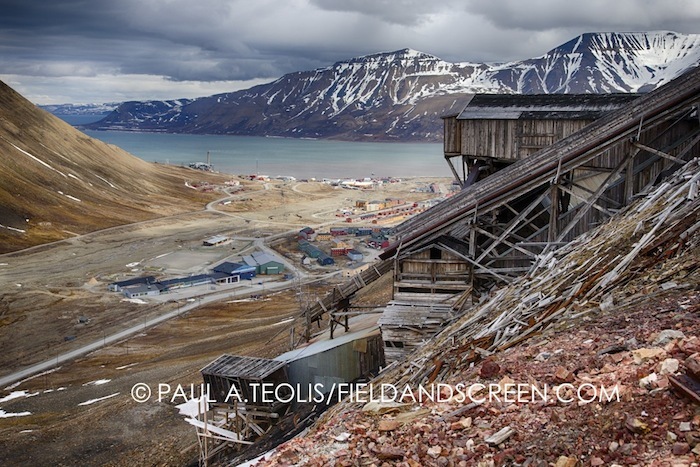 Join Award-winning photographer Paul A. Teolis for a fun, educational, and light-hearted look at Antarctica, working as an Expedition Photographer to an artist residency in the Norwegian Arctic. Through photos and video you will can gain a better insight into travelling to the most remote of destinations where icebergs are the size of buildings, and penguins roam with unwanted abandon in a land where the sun never sets. Paul A. Teolis is an award-winning photographer, educator, veteran of the film & animation industry and a travel-holic. Photography has taken Paul to all corners of the world, and as an experienced expedition photographer, his multiple trips to Antarctica and recently the Arctic Circle continue to feed his love of ice, snow and wildlife. As an animation profession he has contributed work on numerous feature films, television series and independent productions for such notable international studios as Dreamworks SKG, Disney Paris and Nelvana Studios. Paul calls Toronto, Canada his home. Graham Peddie, Product Strategist for Canon Canada, also joins us and will present a number of Canon photographic solutions for professionals and aspiring professionals alike, including the 1Dx and popular, 5D Mk III. Graham directs channel and brand management, marketing strategy, sales support, PR, events, social media outreach and business development for these channels. In addition, Graham runs Canon Canada's Northern Explorer of Light program, quarterbacking a team of highly acclaimed photo and video professionals. The images document media artist Chia-Ling Lee from Taiwan, who performed on an ice flow, while I shot from a zodiac nearby as the performance was also video taped. Shot in one take, Chia-Ling's performance lasted about 15 minutes. SCARY FACT: I have more camera bags than shoes! Canon Canada was gracious to provide me with a Tamrac Expedition 7x camera bag along with the ir Canon 1Dx camera body and a Canon 400mm 5.6 lens to test drive on my latest adventure. Along with my own gear, I took the Expedition 7x bag to the limits. Preparing for travel to any location with photographic gear can always be a challenge when planes, weight restrictions and weather become major factors. Over the last few years, packing photographic gear has become a fine art for me and when I was accepted into a residency program in the Norwegian Arctic in June of 2013 with an international group of 25 visual artists and writers, my polar experience from multiple trips to Antarctica kicked in immediately while in preparation to pack. The bag weighed in at 28 pounds or about 15 kg fully loaded and follows me everywhere while I fly. Everything I needed to shoot, in the event my checked in baggage was delayed, was at my disposal. My tripod and tripod head along with most secondary cables, spare batteries and other miscellaneous items were in my checked-in baggage. I always make sure I can hit the ground running in the event my bags are delayed. Clothes can always be purchased, camera gear, not so much. Once at my destination, I reduce my camera gear immediately and only take what I need when shooting on shore. The rest stayed in my cabin on board ship. The first thing I noticed wearing the Expedition 7x, fully loaded, when the weight limit was at its maximum, was the comfort. A snug fitting backpack with even weight distribution, made it surprising comfortable compared to other brands I have used over the years. I tend to push these bags to their limits this way because when on location shooting I generally bring what I need for that shoot, allowing much of the added weight to be removed when my prime focus is to shoot with only what is needed, instead of everything in my arsenal. Hiking in the arctic terrain during a multitude of conditions, wearing the Expedition 7x on top of my polar layer was not even an issue. The durable material was exposed to wind, snow, sleet and even rain. Rocky, snow-covered and sandy shores, showed no sign of wear and tear on the exterior surface as well. On land shooting in various locations while in Svalbard, I tailor made the interior to handle immediate needs; which generally were 3 lenses and a couple of canon camera bodies. An average day was 6 -8 hours of shooting either wearing the bag or leaving it in a safe area on land while shooting nearby. The majority of the time it remained with me. Outside the majority of the time, the waterproof zipper provided added relief against snow and moisture in this location and while I was disappointed that there was no rain cover provide with the bag, It handled the elements very well during several hours of a light Nordic rain with no issues of moisture leaking through. Inside compartments allowed for storage of cords and batteries quite easily and the see-thru compartments made for easy for finding what I needed at a glance. Compartment construction allowed for easily moving dividers to conveniently store all cameras and lenses snuggly while travelling. 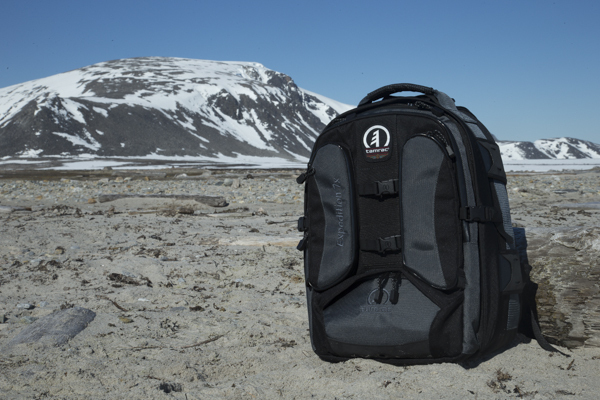 The Expedition 7 is the first bag I have used with the laptop compartment on the outside of the bag and not next to your back sliding in behind the shoulder straps behind. I found this to be a great advantage because it meant all the extra camera and lens weight wouldn't be on top of my Mac Air, not that it would do any damage, but the thought of my laptop resting on top was one less thing to worry about. It was quick to grab and the added weather sealed zippers gave more peace of mind with the elements. Fully loaded and expanded it did challenge one airplane compartment due to the bulkiness of the backpack straps, but sliding them to the side and angling the bag in the overhead compartment solved that problem. The common main flap design, which when unzipped folds back like a lid found on the majority of bags, does expose everything to the elements while searching for gear. A butterfly design or something of similar nature would be a great alternative. Always important to remember, fully zip up the bag before returning it to your shoulders so nothing falls out, something that all of us forget at one point or another. I have fallen victim to sometimes moving to fast to get the next shot. It would be an added bonus if all the backpack straps could be sealed in a self-contained compartment and zipped shut to avoid them being loose and flailing about, getting tangled or stepped upon. Great, solid bag that comes in a variety of sizes to meet your photographic gear needs. Snow begins to fall outside my window at Guesthouse 102, in the sleepy town of Longyearbyen on the island of Svalbard. It's 11 PM and is still as bright as midday. The sun won't set tonight and it will stay light as we are in the land of the midnight sun. Tomorrow we set sail on the tall ship, Antigua with an exceptional group of visual artists and writers. Throw in many with science backgrounds, and we have an eclectic mix of individuals who will all be working on their art projects with the arctic as their backdrop. For me, I will continue documenting the polar regions, wildlife, isolation and will make this up as I go along. This will be my only blog post from this region as internet connections are non existent while at sea. © 2018 All Rights Reserved. Please contact me for content and image usage.